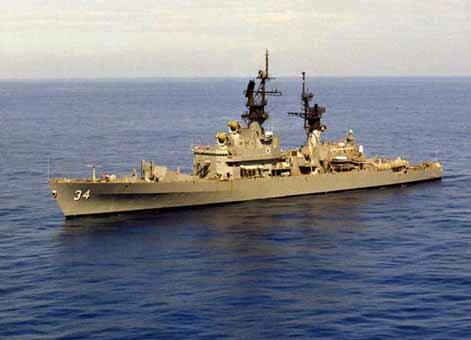 The USS BIDDLE (CG-34), a Belknap-class guided missile cruiser, was commissioned on 21 JAN 1967. Built at the Bath Iron works in Bath, Maine, USS BIDDLE spent a full year post commissioning on the East Coast fitting out and undergoing shakedown training. In January 1968 she stood out of Hampton Roads for the Western Pacific and the coast of Vietnam. Returning via the Suez Canal, BIDDLE completed a circumnavigation of the world during her first deployment. A second Vietnam deployment followed in 1969. Overhauled in 1970-71, BIDDLE returned to Vietnam in April - October 1972. From 1973 USS BIDDLE served her country while deploying to the Caribbean, North Atlantic, Mediterranean and Indian Ocean. USS BIDDLE served her country for 26 years, 10 months and 9 days, until decommissioned on 30 NOV 1993. The hulk of the BIDDLE was scrapped in 2001.